Some people out there are innately cool. Whatever is happening, they know enough about society and its expectations to conduct themselves in an acceptable and awesome manner. They don’t get nervous every time they have to meet new people, they don’t worry for hours about making a phone call, and they don’t despair over the way they ordered a glass of water in a restaurant. They are the Samuel L. Jacksons of social situations, and I am one of them. I don’t know what the opposite of Samuel L. Jackson is, but I think it’s either one of those really shivery dogs or me. Not every situation throws me for a hand-wringing, stomach-dropping loop (For example, eating Cheez-Its. I am so good at eating Cheez-Its I can’t even stand it). Unfortunately, there are some things out there that most people can handle with grace, but that reduce me to a puddle of socially-awkward goo. 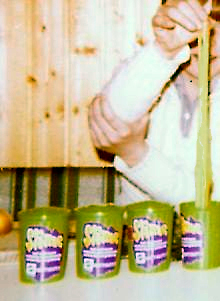 Mattel’s Slime is made of people who couldn’t hack it at parties. Waking up first at a sleepover is a terrible thing. As a kid, I’d tell my friends to wake me up when they got up, and I’d do the same, but waking someone up is way too hard. If you’re awake first, you can’t bounce onto your friend’s chest and yell. You have to resort to more subtle strategies. If you’re on the bottom of a bunk bed, for example, you can poke the mattress until they open their eyes. You can clear your throat repeatedly, but not loudly. You can roll around a lot and hope your rustling wakes them. Whatever you do, when they finally wake up and say something, you have to act really tired and disoriented like you just woke up too. It’s very stressful. Worrying about this would keep me up later than my friends, which meant that most of the time I would be the one who slept later. This is the sort of thing that leads to your mother allowing the other girl scouts in your troop to pour glue on your angsty, pre-teen face. We go to my grandparents’ every Thanksgiving. My extended family is always there, and so are my grandparents’ friends who are in town with no plans. They’re all incredibly nice and expect very little from me besides the ability to carry on a conversation… I fail miserably every time. I can’t hug. I don’t really like being touched, which doesn’t help, but I’m bad at hugging. I need lessons or something. What is the proper arm placement? Over the neck? Around the waist? Do you go halfsies? (Don’t go halfsies. It increases awkwardness, especially if you punch the other person’s arm in your confusion.) How long do you hug? I know there are only a few seconds between Offensively Short, Perfect, and Vaguely Inappropriate, and I can never get it right. How do you account for extreme height differences? How do you extract yourself from a hug gone wrong? Don’t even get me started on the hug/cheek-kiss combo. Girls are weird about their hair. I know this because I’m a girl and having hair makes me a crazy person. I threaten to shave it off, but I have a weird bump on my head that I’m kind of worried has a face, so I can’t do that. The other problem is that haircuts are awful. I’ll go months between haircuts to avoid conversations with stylists. It’s not just the small talk, either, which is not a strong suit of mine. I don’t know anything about my hair, and I certainly don’t know anything about style. When they ask me how I want it, I say, “Whatever you want”, which doesn’t help anyone. They do nothing for my confidence, either. Last time I got a cut, the lady said, “Wow. This reminds me of ‘The Princess Diaries’.” Anne Hathaway starts out with something close to a unibrow in that movie. A unibrow. I hate the dentist’s. I’m not afraid of them, because luckily my teeth have so far chosen to stay firmly in my head in a pattern generally recognized as Mostly Straight and Un-Cavitied. That being said, I dread going. I don’t want to be asked polite questions while someone’s hand is in my throat. I don’t want to try to time swallowing with the hygienist’s blinks so they’re not disgusted by my reflexes. I don’t want to have to move my jaw around discreetly while office gossip goes on above my head. I don’t want to tell any medical professionals the reason I’m missing part of my lower front tooth is that I eat a lot of Smarties. Like, an inhuman amount of Smarties. Even the waiting room magazines are a minefield, because you never know who’s going to judge. If you need me, I’ll be hiding from society in a closet, eating Cheez-Its and relating to Socially Awkward Penguin. Yup, totally relate to all of this. I was just talking to a friend about how awkward haircuts are… she suggested telling the stylist “I’m really tired so I’m just going to close my eyes while you cut” to avoid the uncomfortable small talk. Going to try that one next time. That’s a good idea! But knowing me I’d fall asleep in the chair and drool, then feel awkward about that. So funny and I can definitely relate! Re: the hug-kiss combo: for YEARS I would greet my mother-in-law with a peck on the lips (so not my thing) because she always seemed to be leaning in for one. I finally brought this up to my husband, only to find out I had (apparently and not surprisingly) awkwardly handled a hug-CHEEK kiss combo in the early dating days and she thought *I* liked gettin’ it on the lips!! Oiy vey. Ha! I love this story, which feels kind of mean of me since you were both so clearly uncomfortable the whole time. Did you bring it up with her, or are you still kissing her? Don’t worry, it makes me laugh every time I think about it! She would think it was funny if I did bring it up, but instead I just make sure ONLY my cheek is available! RE: Hugging. For me, the biggest dilema is “to pat or not to pat”. Patting is a great way to signal that it’s time for the hug to end, but it begs the questions when to pat, how many pats? And sometimes patting just seems wrong. It opens up quite the can of worms. But honestly, hugging really doesn’t need to be stressful or awkward because the only reason you’re even getting a hug in the first place is because the person likes you to begin with, so you really needn’t feel awkward imo. RE: The dentist. I’ve noticed that my dentist will do the same thing u described and will talk to me while doing his thing. I don’t know why he insists on doing it since I’m not able to answer him. I just assume that it must be awful to be a dentist so I forgive such behavior. anyway, great blog post. awkward and proud!! 2) I’ve never thought about patting to end a hug! If there are pats involved, I’m usually trying to comfort someone and failing miserably. Now I’m going to try it. But first I’ll hug a pillow or something to get the right number of pats down. 3) Maybe dentists just get so bored that they have to talk to someone? Or maybe we just keep having really outgoing dentists who don’t really want a response, they just want some kind of social interaction. I usually try to wiggle my eyebrows sympathetically or in confusion, but it turns out that’s the same eyebrow movement so it never helps. Haircuts, ugh. This is why my hair is so long. I’m actually pretty good at small talk usually, but I hate hair stylist small talk. HATE it. That makes me feel SO MUCH BETTER. This means that maybe it’s not me who’s failing at small talk. Maybe hairstylists purposely put us all in awkward small talk corners that it’s really tricky to talk your way out of. Hey girl hey. It makes me feel way better you said that, because you’re good at being social. Which means it’s not me, it’s them! Here’s an awkward moment from the dentist…When I was in probably third grade I actually threw up when they were trying to take X-Rays….the hygenist recoiled in disgust..and then I swallowed it. Ha. Ewww. It would be hard to bounce back from that one. The only dentist trip I remember as a kid involved a Highlights magazine, a really nice female hygienist, and a really nice dentist who made me cry anyway just because he was a man and the lady clearly had already looked at my teeth. But crying because the dentist’s gender scared you is definitely not as bad as throwing up. You sir, win the Awkward Dentist Award. Agh! That is THE WORST conversation because you always get caught. There’s no way to say, “No, I didn’t get it cut somewhere else. It just fell out at weirdly perfect lengths, and it was always this color, you’re just remembering wrong.” My ideal salon would be one where I could drop off my hair for an hour, run some other errands, and then come back to pick it up with no chitchat whatsoever.